There’s a new warning out for those who rely on EpiPens. Medical experts are now saying exposure to extreme temperatures, even less than 12 hours can decrease the medication’s effectiveness by 14%. 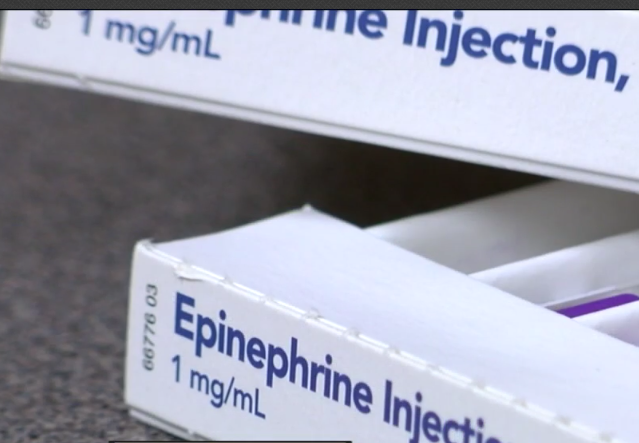 PALM BEACH COUNTY, Fla. — There’s a new warning out for those who rely on EpiPens. Medical experts are now saying exposure to extreme temperatures, even less than 12 hours can decrease the medication’s effectiveness by 14%. “Extreme temperatures can absolutely accelerate the degradation of the product,” said Delray Medical director of pharmacy William Fagan. Medical experts say a lot of parents admit to leaving an EpiPen inside a car, usually in the glove compartment or center console. “Our son has had several reactions where we’ve needed to give epinephrine, time is of the essence,” said palm beach gardens mom Laura Hass. Hass runs the support group, No Nuts Moms Group of Palm Beach County, where parents can share information and advice about medication and managing food allergies. She says she never leaves an EpiPen in a hot car, instead using an insulated pouch. “A rule for us personally is to keep our EpiPen with no locked doors between us,” said Hass. The rule is a way to ensure the medication isn’t exposed to extreme temperatures, and it’s a piece of advice that medical experts agree with. “Extreme cold has the same effect, so leaving it in the freezer doesn’t help the product, it actually accelerates the product as well,” said Fagan. Fagan says one way to tell if the medication isn’t as effective as when you first received it is the color. If exposed to extreme temperatures it will have a rust appearance. However, not every manufactures design allows you to see inside so your best bet is to talk to a pharmacist or doctor about any concerns you may have.